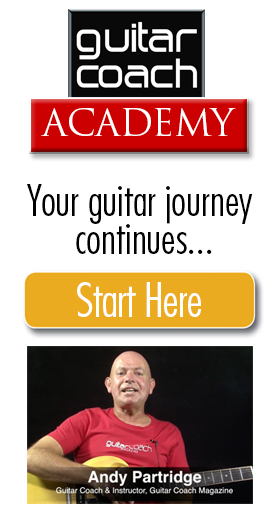 You finally splashed out the cash on a flying V and have been practicing your best Metallica impressions, but where do you get started to becoming a metal god? 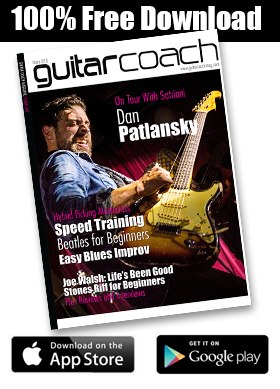 Through this series of monthly articles we’ll be looking at the techniques to get you playing some metal guitar. Things we’re going to look at include palm muting, essential techniques such as pinch harmonics, and the harmonic minor scale. To start things off we’ll look at palm muting (just like it says at the top there!). From Black Sabbath to Machine Head, palm muting is an essential technique for any metal guitarist. 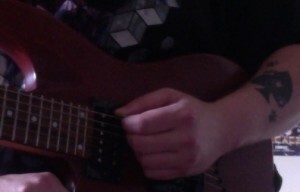 Precise alternate picking and placement of the hand are the keys here to get you on the way to either playing your favourite riffs or coming up with brutal riffs of your own! For the following examples we’ll be in drop D tuning, a tuning used by bands such as Trivium as it sounds heavier than standard tuning and makes it easier to play power chords. The tuning (from the fat string closest to you) is as follows: D-A-D-G-B-E. Example one down below is a helpful tuning guide. Now let’s get to playing some examples. For this (and the vast majority of metal), you’ll need a distorted sound; clean just won’t cut it! 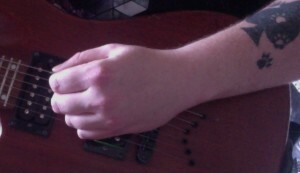 Palm muting is achieved by resting the palm of your picking hand on the strings near the front of the bridge. Your hand should be relaxed but firm against the strings and you need to make sure that there are no notes ringing out when you play the examples. Below are pictures of the hand position I use when palm muting as I find this gives me the best sound. I try and have the part of my palm closest to my wrist resting on the strings; however, feel free to experiment and see what works for you! You may find that if you have a tremolo system on your guitar, putting your hand in this position makes the strings sound dead and lifeless. As mentioned before, it all comes with experimentation. 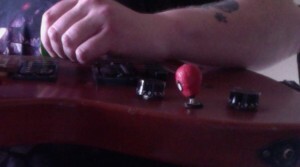 When in the studio I’ll normally use a guitar with a tune-o-matic style bridge for any palm muting parts. Example two is a simple 8th-note riff played on the lowest string to get you used to the technique. The best way to count it is to tap your foot along with the beat and count the riff as ‘1& 2& 3& 4&’. The BPM (beats per minute) for the following examples will be 130, but feel free to slow things down with a metronome if you feel that any of the examples are too fast for you. Accuracy is the key here, not speed! Now we’re going to add in a D5 power chord on the first beat of each bar. You do this by playing the open low D and A strings using a down stroke. The things to watch out for are to make sure you go back to alternate picking for the rest of the bar once you have played the chord. Also, make sure you mute the rest of the strings with your fretting hand; you don’t want any unwanted noise from the other strings! For the last example, we’re going to use the same rhythm as before, except this time we’re going to put some more chords in. You’ll use the same picking pattern as before and use your first (index) finger of your fretting hand fret the chords F5 on the third fret and G5 on the fifth fret. This adds more life to the riff, makes it sound more like a standard metal riff, and gets you used to playing chords between palm mutes. To stop your practice becoming stale, it’ll be a good idea to start writing your own riffs once you get the examples down. 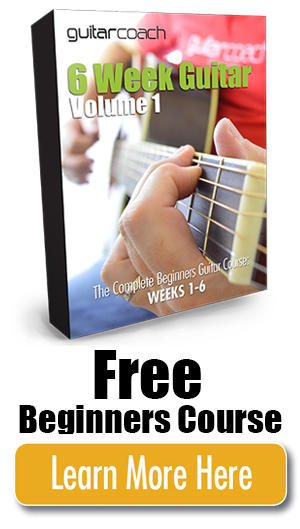 The end goal for anything you learn should be to make music from it as soon as possible! 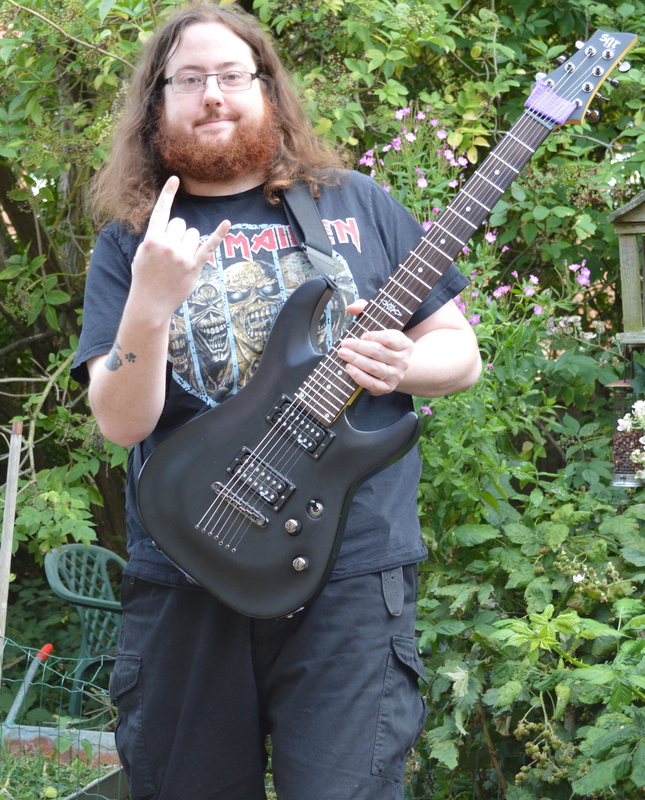 That’s it for this month, so join me next month to continue your metal journey! Any questions please feel free to send me a message via my Facebook page. Chris Ward is currently studying a degree in Popular Music Performance at B.I.M.M. London. He also teaches and is one of the guitarists for the Corby International Orchestra, and is on the artist’s database for CORD Worldwide. He plays electric and acoustic guitar, bass and some keyboard. When not playing, writing about, listening to, or thinking about music he can be found causing havoc with his local Viking re-enactment group, playing tabletop games or at home with a cup of coffee and a good book.